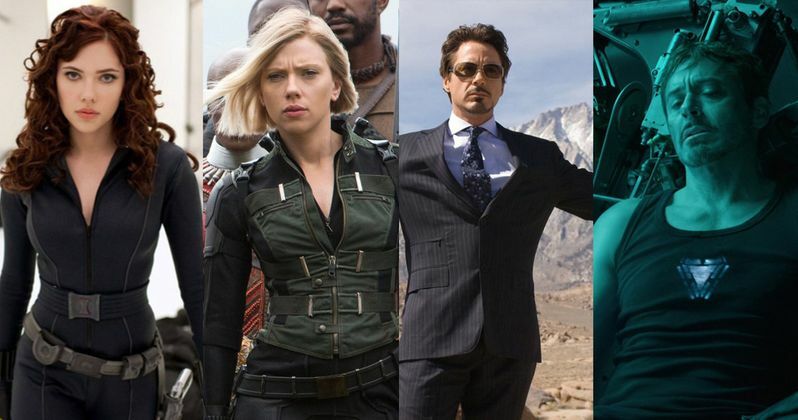 It's hard to believe, but the Marvel Cinematic Universe is now over 10-years old. As Marvel Studio prepares to launch Captain Marvel and Avengers: Endgame this year, they decided to get in on the #10YearChallenge fun with the original cast of The Avengers. Robert Downey Jr. helped to launch the MCU back in 2008 with Iron Man, and the rest is history. Not even Marvel Comics fans anticipated how big the MCU was going to get and that it would still be going strong after all 10-plus years. The #10YearChallenge is all over social media at the moment, which sees participants share a photo from ten years ago along with a current photo. The two photos are supposed to show how much has gone on in one's life in the last decade, either good or bad, and present it to friends and loved ones. The challenge took off and has already seen quite a few parodies, but Marvel Studios has taken the challenge pretty seriously by showing us the original Avengers from the past and into the present. Iron Man (Robert Downey Jr.), Thor (Chris Hemsworth), Captain America (Chris Evans), Black Widow (Scarlett Johansson), Nick Fury (Samuel L. Jackson), Phil Coulson (Clark Gregg), and Hawkeye (Jeremy Renner) are all featured in Marvel Studios' #10YearChallenge. The studio bends the rules a bit and shows Fury and Coulson from Captain Marvel, which features de-aged versions of Jackson and Gregg since the movie takes place in the early 1990s. It's pretty cool to see how the actors have changed over the last ten years, along with some pretty interesting haircut choices from Thor. Plus, it helps to promote Avengers: Endgame. Marvel Studios also shared a picture of the original logo compared to what it looks like now with the 10 incorporated. MCU fans have even gotten in on the #10YearChallenge with some pretty humorous results. One person decided to share a challenge with Aunt May from Spider-Man 3 in 2007 up against Aunt May from Spider-Man: Homecoming in 2017. Rosemary Harris plays an older, more traditional version of the character, while Marisa Tomei plays the updated and younger version. However, another #10YearChallenge could have used Sally Field from the Andrew Garfield take on the iconic webslinger. Avengers: Endgame doesn't really need any help in the promotional department at all. The trailer is out and MCU fans are counting down the days, which is less than one hundred as of this writing. However, before that movie, we all have Captain Marvel to look forward to, which should help to shed a little light on what we're about to see when the upcoming Avengers project hits theaters. Right now, the MCU is poised to have another record-breaking year between the two aforementioned movies and Spider-Man: Far From Home. You can check out the Avengers #10YearChallenge below, thanks to the Marvel Studios Twitter account.